We have international senior executive & board operating experience in public & private large (multi-billion dollar), mid-sized, small, and start-up life science companies, and with this, are accustomed to assignments that are complex, multifaceted, and entrepreneurial. Our experience is deep across therapeutics, diagnostics, and medical devices. We know how each of these sectors function and inter-relate in terms of corporate strategy, operational leadership, and finance. We have access to a network of highly successful individuals with track records at the Vice President level and above in a variety of technical/operating disciplines who can team with us on iSci Management assignments. This includes company start-up, fund-raising, growth acceleration, portfolio optimization, restructuring/turnaround or wind-down, and transactions. Given our experience, across the R&D-manufacturing-commercial-BD continuum, we can provide a view from the outside-in and thereby provoke new thinking and action. Having raised significant public market & venture capital funds and having completed a variety of transformational transactions, we know how to create a compelling company vision, and marry it to strategy and capital/financials in a way that optimizes resources, mitigates risk and creates real & sustainable value. 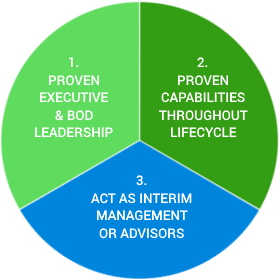 We can act either as advisors or, if preferred by our client, as interim management or board members with full strategic and/or operational responsibility for the role(s) defined.